DonorSnap's online forms are a great way to collect things like email addresses, event registrations, and online donations, but it can also be used to encourage one-click social media interaction as well. Each form that you create has a customizable confirmation page and header/footer that can be modified using html. Don't let the html scare you away, Facebook and other social media tools will do all the code writing for you. All you have to do is copy and paste. "Social plugins" is the term that Facebook uses for these easy ways to interact with a Facebook page. For example, you could place a "Like Box" that allows your visitors to like your organization's Facebook page before closing the form confirmation page like you see below. Like boxes aren't interactive in emails, but on a webpage, clicking the Like button will immediately record the new like right on the page. To get started and choose between Like Boxes, Share Buttons, Activity Feeds, and more head over to the Facebook Social Plugins help page. 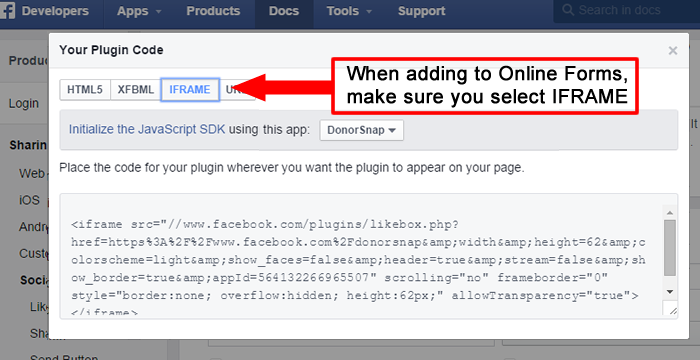 Copy the html code that Facebook creates for you and open up DonorSnap. In the confirmation tab or the header/footer tab, click the HTML button at the bottom of any of the text editors and paste the code that Facebook generated for you. Now your Facebook Social Plugins are live on your forms! You don't have to be intimidated, because Facebook's code generator does all the work for you. Give it a shot today by starting at the Facebook Social Plugins help page. If you use an @yahoo.com or @aol.com email address, you need to be aware of changes that recently went into effect. Each of these companies have implemented new new spam prevention settings, which may affect emails sent from your DonorSnap database. All emails sent from those email addresses must be sent through Yahoo or AOL servers or they will not arrive in your recipients' email inboxes. 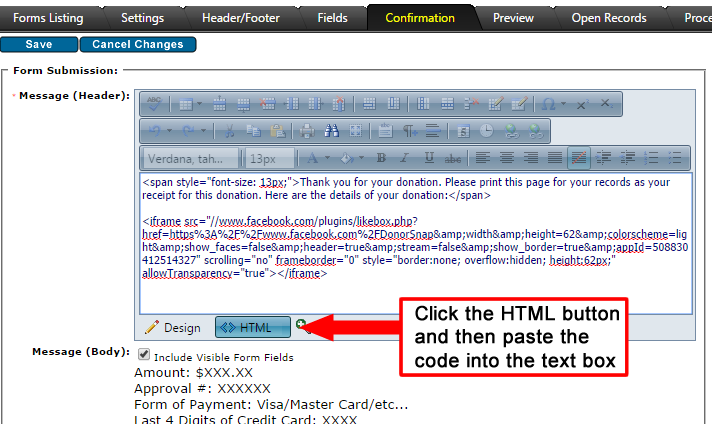 DonorSnap has several features that can send emails on your behalf through DonorSnap's servers. These systems give you the opportunity to personalize the From: email address so that your recipients can recognize your organization. You can still send to all @yahoo.com and @aol.com email addresses, but if you use an @yahoo.com or @aol.com email address in the "From:" line for any of these emails, they will not be received by your recipients. You must instead use an alternate email address. *These features use the default organization email address found under Maintenance > Site Setup. If you have any questions, please email the support team. If you haven't already seen the three new reports in DonorSnap, you'll definitely want to check them out now. These new reports were the most requested reports by DonorSnap users, so chances are, they will be helpful for your organization. Here's a quick summary of each of them. Contact Profile Report: an easily printable summary of contacts. This report can be customized to include or exclude data from all of the tabs in your contact database. The contact profile is especially helpful for volunteers as a call sheet without needing access to your entire database. You can run this report for individual contacts or in small batches. Watch the Contact Profile report video here. Periodic Comparison Report: a comparison view of donation data over multiple time periods. This report can be segmented to analyze contacts, campaigns, donation types, etc over any time period. Select between monthly, quarterly, or yearly groupings, or use a specific number of days instead. The report will display the donation amounts in each time period per segment along with totals for each column and row. Watch the Periodic Comparison report video here. Pledge Forecasting Report: expected income from pledges in the future. Examine your pledges according to a number of factors such as contact, campaign, accounting code and more to help your organization easily know what to expect. The data can be grouped by any time frame so that you also know when to expect it. Watch the Pledge Forecasting report video here.